We’d love your help. Let us know what’s wrong with this preview of Search Patterns by Peter Morville. To ask other readers questions about Search Patterns, please sign up. I'm really confused by this book. 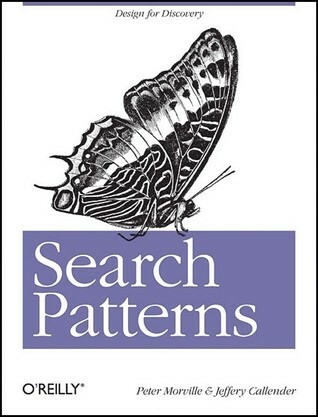 I've expected professional book full of search patterns but I've got inconsistent mix of patterns and fairytales. Sometimes it goes straight to the point, sometimes it describes things so generally that you read 2 pages and still don't know what it wants to tell you. It starts with comix narrative but it disappears somewhere and gets back at the end. Good stuff, covered exactly what I was looking for aka agreed with me. This book's excess of rhetorical mumbo-jumbo belies its valuable message that search is being (and should continue to be) reinvented to move beyond the constraints of the conventional search box. You This book's excess of rhetorical mumbo-jumbo belies its valuable message that search is being (and should continue to be) reinvented to move beyond the constraints of the conventional search box. You could read only the first 60 pages of this book and not miss much. That first chunk contains the actual content of the book: ideas about the historical limitations of search and ways in which it might expand. The rest of the book lists common search patterns and examples of search engines, most of which should already be familiar to anyone who uses a computer a lot. *Search is currently limited by the constraints of a basic search box. It's an accepted pattern, but may not be the best solution. It requires people to know the correct keywords (p. 2-5). One way of reframing this is with contextual recommendations (such as on e-commerce sites) and discovery tools that recommend related content based on content you like (p. 12). *Search must be iterative and interactive to get at the underlying needs behind a question (p. 9). *There's tension between users wanting to see only the results they're looking for and vendors wanting to attract them with related results (p. 26). *A good search is federated, faceted, and fast (p. 45). *"Thrashing" is an antipattern where a user iteratively refines a bad initial search (such as one with a typo) rather than exploring other ways of phrasing (p. 60-1). *When designing a search engine for experts in a domain, don't expect them to be experts at searching (p. 146). *Some other forms search might take are a message projected to parts of a social network, a decision tree, a list of related topics, or a serendipitous suggestion (p. 151-3). *Comparing the external searches people use to reach a page with the searches they make once they're on the page can provide insights to improve both your search engine optimization and information architecture (p. 156). This book makes a good job in cataloguing and exploring a wide range of search applications - from the most notorious generalistic search engines to some peculiar, more specialistic,services - , and above all , in expliciting the human behaviours that trigger the search and the approval (or disapproval!) of results by the users. At the same time, the authors try to give a perspective to the future of search, from the starting point of the actual, most evoluted implementations, such some of the ne This book makes a good job in cataloguing and exploring a wide range of search applications - from the most notorious generalistic search engines to some peculiar, more specialistic,services - , and above all , in expliciting the human behaviours that trigger the search and the approval (or disapproval!) of results by the users. At the same time, the authors try to give a perspective to the future of search, from the starting point of the actual, most evoluted implementations, such some of the new modalities we got today in the “mobile” field. Its writing style is quite smart and easy to follow, and the book also succeeds to keep a good equilibrium between textual and visual contributions. If I have to find a “con”in all its “pros”, I'd say that the authors didn't feel the need to go more in depth , leaving to the more technically oriented reader the need to enrich and fulfill the reading of this book with other resources such (not casually,I presume!) titles in the O'Reilly catalogue, like “Ambient findability”, from one of the authors of ”Search Patterns”, the influential “Information Architecture for the World Wide Web” or the many books exploring the various facets of interface design. Pretty much impressed and will read it few more times again! "I mean enchanted objects. What I'm proposing is a metaphorical relationship between magic and portable, network-aware, information processing objects that is analogous to the relationship between office supplies and computer screens in the desktop metaphor. I am explicitly not advocating pretending that technology is a kind of magic or lying about how technology works, b Pretty much impressed and will read it few more times again! "I mean enchanted objects. What I'm proposing is a metaphorical relationship between magic and portable, network-aware, information processing objects that is analogous to the relationship between office supplies and computer screens in the desktop metaphor. I am explicitly not advocating pretending that technology is a kind of magic or lying about how technology works, but using our existing cultural understanding of magic objects as an abstraction to describe the behavior of ubiquitous computing devices." As a general introduction to the theory and practice of online search capabilities, this book covers the why, how and what’s what of search functions and interfaces in a cross-disciplinary way, including examples of search patterns for inspiration and analysis. Those interested in learning or teaching online research methods or information architecture might find this a good place to start for insight how search functions influence how people see, navigate and interact with digital texts. Morville provides a poetic overview of discovery tools that are implemented today and offers a couple thought-provoking scenarios of search in the future. The chapter on "engines of discovery" was a huge let down though, being almost an extension of a previous chapter with some random specific implementations Morville decided to toss in. Aside from that, a very good read if one is considering different methods of search. Pretty engaging overall. Some of the writing was a little distracting - too much flair which detracted from the substance rather than added to it. There were also lots of references, especially in analogies, to things that aren't necessarily common knowledge. I did appreciate how the tone was inspiring rather than simply factual. You can tell the authors are passionate on the subject. Just like the title suggests, this book is a collection of patterns. Authors give little practical advice on when to use this or that one, sticking with basic descriptions and musings on what's possible search-wise in the future. This is a great introduction. Many things will be familiar, though you might not have a name for them until he gives you one. It's not earth-shattering stuff but it is a great place to start if you're designing something. Nice book about design of search user interfaces and offers many different patterns and ideas to use. It is probably more useful for UI designers but as we are all using so many search interfaces every day it is interesting to read more about them and where they may be going in the future. Very easy read on search patterns! Wow. the search domain is just 10 years old. very interesting and easy read. A very nice introduction and overview of the general issues and challenges of search. Not a deep read in any sense, but a good launching pad to explore the challenges of findability. This will aid my lifelong dream of becoming a "user experience" worker for Google. This is all about design, interface, technology, and researching. Pure genius, simply pure genius. It would be great to read a bit more recent edition of this book. Because now examples (e.g. iPhone 3GS) seems a bit outdated. I've read and enjoyed Morville's "Ambient Findability". This was not quite as good for me; too much survey of the landscape in too short a work. But still one of my favorite topic spaces.